PM leaves for Warsaw conference, wonders how European nations can continue to support Iran even as Iran sends terror squads there. 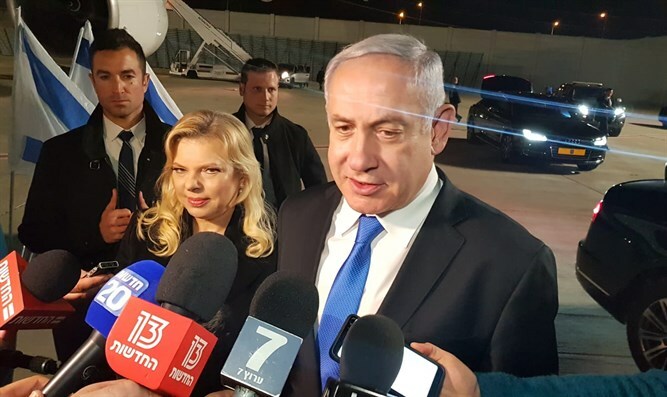 Prime Minister Binyamin Netanyahu departed for a conference in Warsaw Tuesday night. Netanyahu stated that he conference will focus on ways to counter Iranian "aggression, it's desire to counqer the Middle East and destroy Israel. What's important is that many countries are uniting against this aggression." Arutz Sheva asked the Prime Minister what was meant by the statement "bringing US policy to Europe." "There's a curious thing happening in Europe. Iran is actually sending its terrorist squads and they've already killed people in Europe. It's sending its terrorists there, and at the same time, certain European governments are courting Iran, trying to curry favor with them and give them advantageous terms or ways to go around the American sanctions. "The fact that on European soil today there's a meeting ground [with many European nations participating] on this is very important," Netanyahu said. When asked what would be considered a successful conference, Netanyahu responded: "The actions we are taking are blocking Iran. We operate every day, including yesterday, against Iran and against its attempts to establish itself in the region." "Unequivocally, economic pressure is felt in Iran's attempts against us. Iran has a hard time placing advanced weapons systems in part because of the budgetary limitations and the overall actions we are taking." Arutz Sheva will accompany the Prime Minister during his visit to the conference.